Every mom knows decorating the nursery is one of the most exciting parts of nesting. You’re so eager to make everything just perfect for your new bundle to come. But eventually that tiny little newborn grows into a toy tossing, personality filled toddler who’s room needs an update. Most toddlers no longer need an abundance of pacifiers and are slowing making their way out of diapers. Here are 3 easy changes you can incorporate to convert your little’s nursery to toddler room. It may be heartbreaking to pack away that beautiful white fur rug but changing the rug makes a huge difference. Now that your toddler has their favorite characters, grab them a play rug to set the opening act of the room. Since Max loves Mickey, Santa snagged a $15 Mickey Mouse play rug at Toys R Us. Its soft and came with a little car for him to drive all around the MM Clubhouse with the gang. PIN IT!Don’t get me wrong, I’m not stripping down the cute wall art I bought for the nursery but instead I’m going to add to it. Max loves turtles, dinos, and monsters so we hit up Etsy to find art pieces. The great thing about Etsy is that you not only have tons of designs and colors to choose from but you also are supporting small businesses by purchasing a piece. As you all know, I’m huge on purchasing local and USA made products. Brentwood Home uses a combination of organic, non-toxic, and natural materials when creating their products. They design and craft everything with as many local materials as they can in their LA based factory. When you bought your crib mattress did you prepare for having a newborn and toddler sleep on it? Probably not. 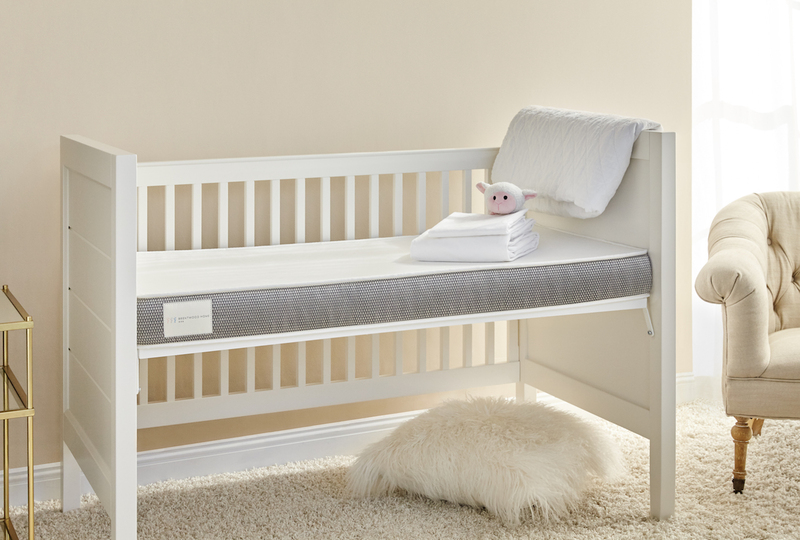 Brentwood Home’s Poppy Crib MattressPIN IT! is the way to go. The Poppy was made with two layers, one firm side for your infant and one soft side for your toddler. So when your converting your nursery to toddler room, all you have to do is flip the mattress. Its that simple. Oh, and don’t worry about messes, the mattress’s waterproof cover is super easy to clean! Want to know something else toddler’s love? Bean bag chairs. Brentwood Home’s Lounger is a plush hugging seat made with non-toxic polyurethane and gel memory foam. It doesn’t matter if your toddler can read yet or not. They love to explore and look at books now so why not create a great habit out of it when they’re this young? Its the perfect place for them to snuggle up and read a book or relax while watching their favorite show. I teamed up with the folks at Brentwood Home for this awesome Baby Bundle giveaway, featuring their Poppy Crib Mattress mentioned above and a Sweet Pea changing mat(my fave!). This bed is the perfect size and feel for growing children, plus it’s made with healthy, natural materials that are safe for you and your home. Also, you can use the Brentwood Home Coupon code “OURHOME” for 10% off! I like decorating with barn wood. My favorite piece to decorate with is a old step stool from my grandma. It’s a classic piece that can be reworked over and over. My mother-in-law took a painting class and painted a sunflower for my daughter’s room which perfectly matched the rest of the room! I love hand me down stuff! My girls use the same old wooden dresser I used as a kid. We added some fresh paint and it looks so different! I also had 2 small wooden chairs in my bedroom that my girls have now. I have the vanity from my Grandma and one day they will get that too! My favorite piece to decorate with is a music box that was handed down to me. Sweet and innocent and love working around it for my little girl. The only thing I have redecorated was my parents living room door. I love to have a fancy crib blanket. It really helps complete the room! I love finding old things to decorate with. I love decorating with wall mural stickers! My favorite piece to work with is a pen and pencil stencil set. I love re decorate in animated characters. The are bright and colorful. I have an od rocking chair from my grandmother. Love barn wood, going after more very soon, waiting on weather to get a little warmer. Are you good at building? I’d love to be able to do stuff like that! I like to use unusual things, and make new things to decorate with. I love decorating with anything vintage! I love to decorate and refinish older furniture. We also have a of of hand made things by us. We made an entertainment center for our living room recently. I love using fabric to change the designs. Draped fabric to make a reading nook. Covering dresser knobs in fabric. Re-covering old pillows. So many things a piece of inexpensive fabric can do to quickly change the look. I love decorating with old furniture that we can re-finish. I love to decorate with pictures and candles. I like to decorate with old stuff as the focal and modernize it from there. I love old barnwood, sayings and pictures burnt on it are beautiful! I love to decorate using pottery my husband made! Oh, I bet its beautiful! Our decor is mainly family photos along with two Thomas kinkade paintings from my grandmas house. I like to decorate with paintings. I love to decorate with reclained wood! Wow, I like to decorate with everything! Pillows, paint, decals, etc. I love decorating with fabric! My favorite thing to decorate with is old pieces from our local resale shop. I love decorating with photos of our adventures!! I love the hand painted art work from my grandkids! I love decorating with barn wood & pallets. My husband made a hanging bookshelf from a pallet & it looks adorable in our nursery! I like decorating with wall art. So many options and ways to switch things up to keep it updated! I love decorating with pastel colors. Anything solid wood that I can repaint and customize! I love to decorate with pictures.. and wall stickers. I love to decorate with fun pillows. Combining different patterns/textures. What a fun giveaway!!! I love decorating kids rooms, it’s fun when they transition to older ages to redo their rooms! That wall art is the best! I think it’s such a genius way to nip the “monster under the bead” fear before it even starts! You did an awesome job. That teepee is the cutest thing ever! I absolutely love it. I like to decorate with handmade items like quilts and wood carved items. That tee pee is so cute! I love that idea in a toddler room. All of this looks really nice! I don’t really have a favorite piece to decorate with. My boys and I had such a fun time transitioning their nurseries to big boy rooms. It was great to have their opinions and perspectives and really see their personalities shine through the decor they choose. I love decorating with a mix of pastel and vivid colors. These are great tips. Good luck for those who are joining. I want to have talent like yours. I am creative in thinking but when i does things it doesn’t look good. Lol! I love the ideas! I love the look of this room. The little nook under the bed is a fantastic idea. My grandson is moving on up! This is adorable! What a cute nursery conversion! I love little kids rooms, they are so fun!! These are fantastic ideas! Both of my kids have reading nooks and they love them! I love Brentwood Home. Their stuff is so amazingly made! My favorite thing to decorate with in the nursery is my own watercolor art! Great tips here! Love how colorful and fun your blog is! These are all great ideas – we just converted our youngest sons bedroom – such an emotional but fun experience! I love it. We transitioned my son’s crib into a toddler bed. He stayed in it until he was 3.5. Then he asked for a big boy bed for Christmas. I love the teepee. I love mixing vintage with modern. Thanks for the giveaway! I have an antique store, so anything old that can be repurposed safely. I love using old dressers and making them into new statement pieces. I love to decorate with paintings and drawings I created for us! It really gives everything that personal touch to make it feel like home! Super cute ideas and I love the decor but can I say one thing, that freestanding ladder by the tent is scaring the heck out of me. I can just see a toddler climbing up it and pulling a Clark Griswold and falling completely over. LOL But the wall art though, it is an amazing space. I love to decorate with prints and pictures – they are easily changes and can be subtle with neutral tones or bright and fun. What a great giveaway! I have been reading a lot about Brentwood home lately, they carry so many great home items. I love decorating with artwork and anything that is simple and interchangeable for mutliple ages. I love decorating with murals! I like decorating with art. It adds a touch to each room in the house. I like to give old things new life.A coat of paint does wonders! I like using small add-ons! I love updating antique furniture! I like to find a fabulous art piece and decorate the room around that! That would be a fun DIY for toddler parents! I love all the goodies Brentwood offers. I love decorating with wood pallets. Anything nautical is always cute!! I like decorating with items i find at the thrift store, like this wonderful small bookshelf I repainted. I love my wood picture of an elephant! I love using decorative pillows!! I love wooden signs with cute quotes. I love decorating with words, the ones u stick on walls, or the photos with word phrases! Venice Lounger is the piece which I could see my granddaughter curled up with a book. My daughter has a personalized snow globe that I love decorating around. I love decorating with blankets! I have an obsession with decorating the house with old glass jars and vintage mirrors! I like to decorate with vintage pieces! I like decorating with upcycled things like dressers I like to personalize. I love decorating with wall art. I like to decorate the wall. I like dragons to decorate with. I love to decorate with pieces that are painted with a theme in mind. The walls to the dresser with flowers or animals that go together. I like decorating with items that were my mom’s. A framed footprint and picture of my baby! I love to decorate with bedding. In general, a successful nursery to toddler room transition is one that allows for independence in a safe place. Not sure how or when it happened, but at some point your sweet snuggly baby became a full-blown, fiercely independent, yet incredibly needy toddler.